Invasion of half sarees into bridal trousseau is very evident. 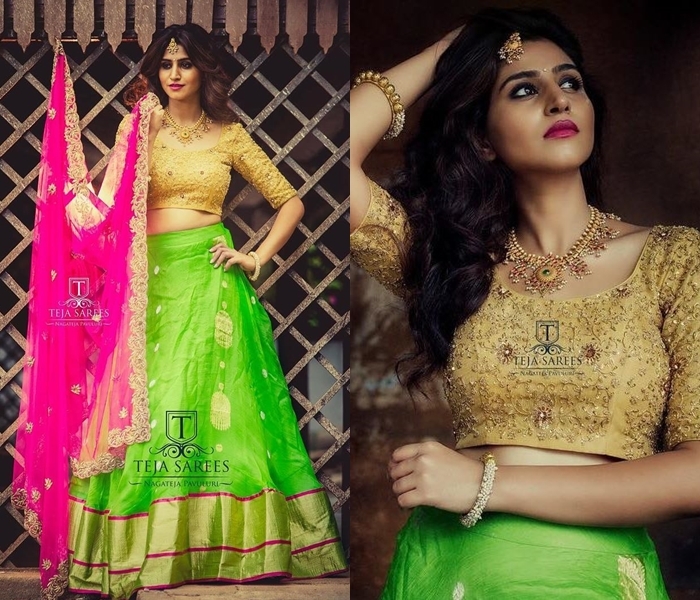 This traditional attire is making a great comeback this year. So if you are still basking in the glory of heavy designer sarees and lehengas, you need to make room for half sarees too. Modern half sarees are unbelievably chic in terms of color choice, embellishment and fresh appeal it brings to the ethnic fashion. Needless to mention the array of blouse choice available to make them look even more spectacular. Half sarees are going to stay strong in the coming year too. So if you have been thinking in investing on them, you might as well do your research on all the possible blouse designs you can wear with it. 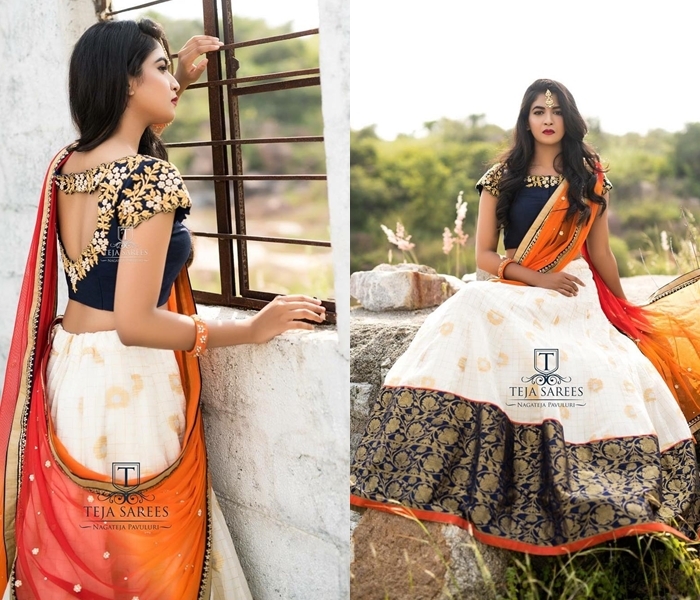 Recently one of our favorite boutique ‘Teja Sarees’ have launched array of half sarees and blouses that broke all our will to end this year’s shopping. 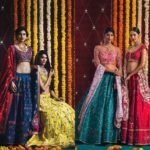 With chic designs, stand out fabrics and lust worthy adornments, their half saree collections are everything a modern bride would want in her wedding ensemble. 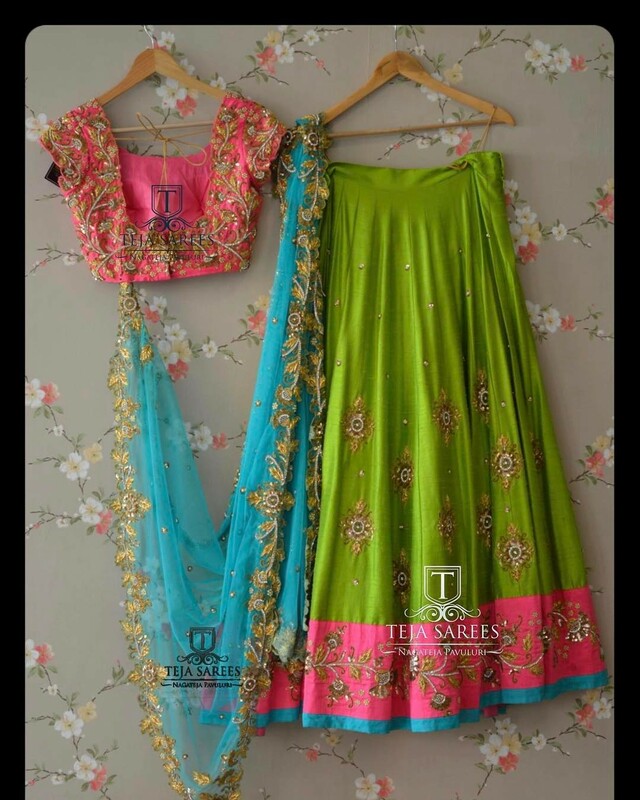 We also loved how creative and innovative you can make your half saree look by opting for elegant blouse designs. 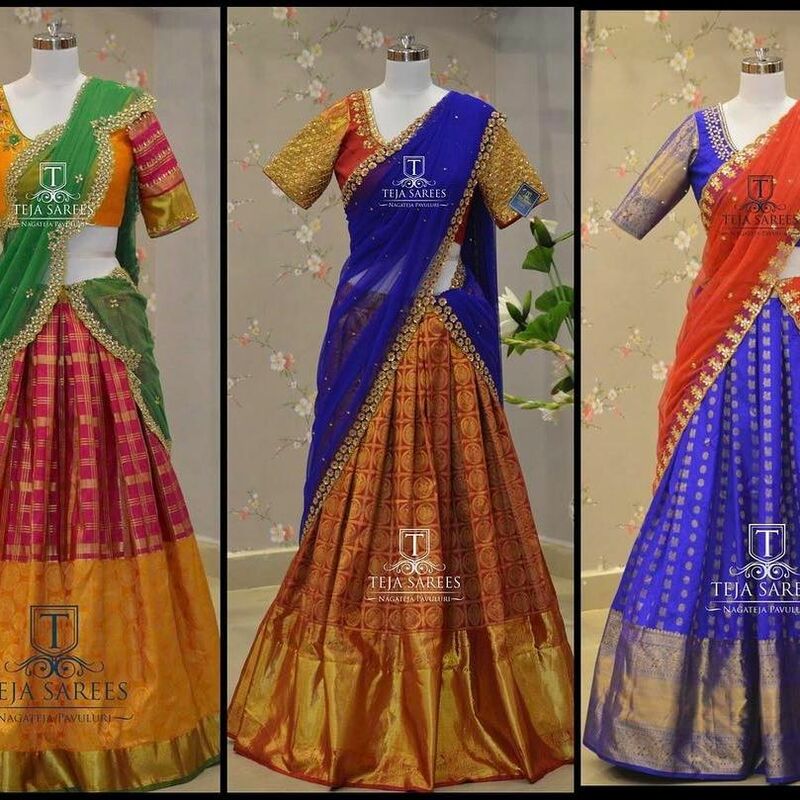 So if you have been looking for latest catchy blouse models to wear with your half sarees, then Teja Sarees will give you all the inspirations to find the best. 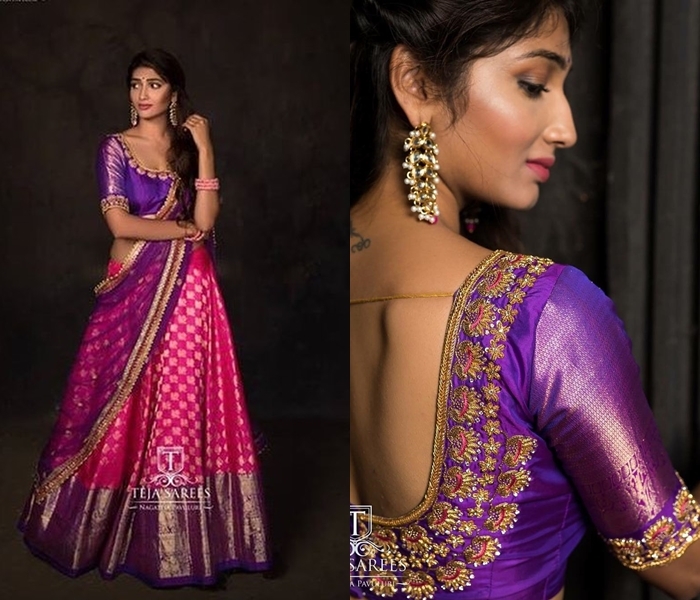 Scroll down and take a look on the regal half saree blouse designs from this label. In case, if you like to shop from them, contact details are given at the end of the post. Here is a gold blouse with mind blowing zardosi work. 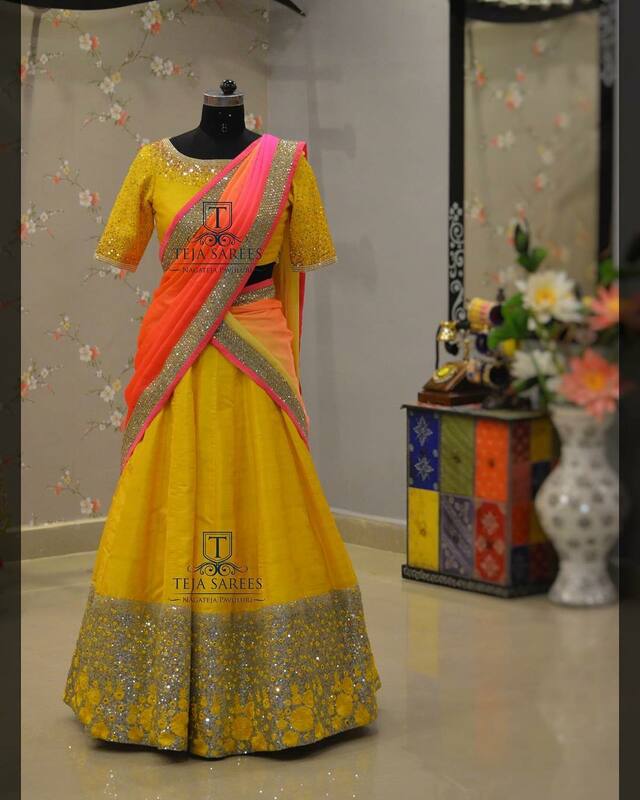 A blouse like this is enough to brighten up any half saree of yours. Throw in glittery kundan work on the blouse, and wear it with net skirt. This irresistible combination is bound to attract all attention. If you like glittery part wear, then this simple blouse with scattered shimmer dust will nail your party look. Go contrasting with your blouse, and opt for attractive stone work like the one below. 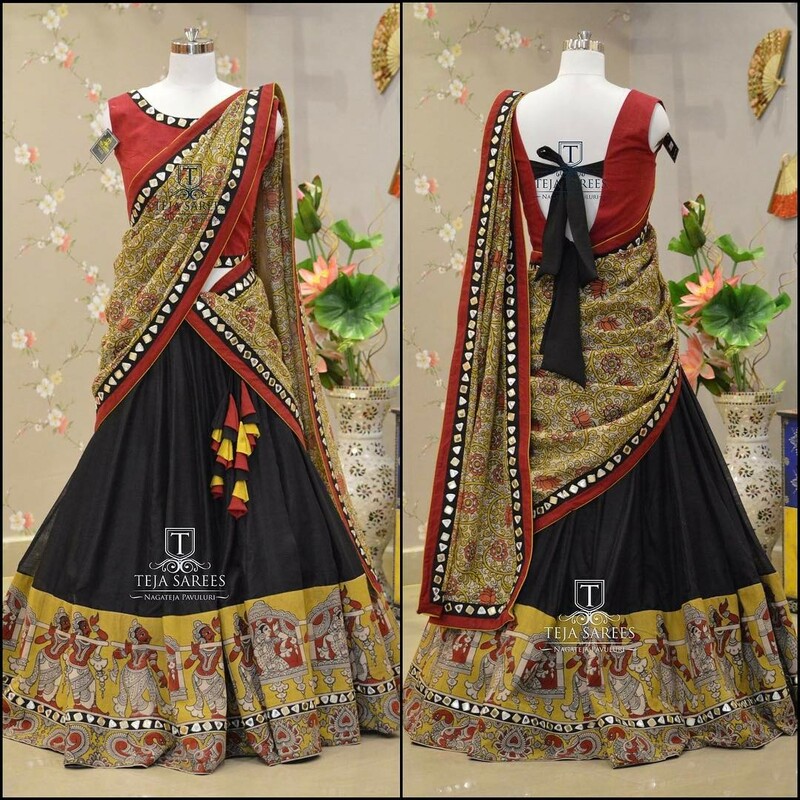 The dark blouse shade and the catchy stone work add a fine touch to this half saree. 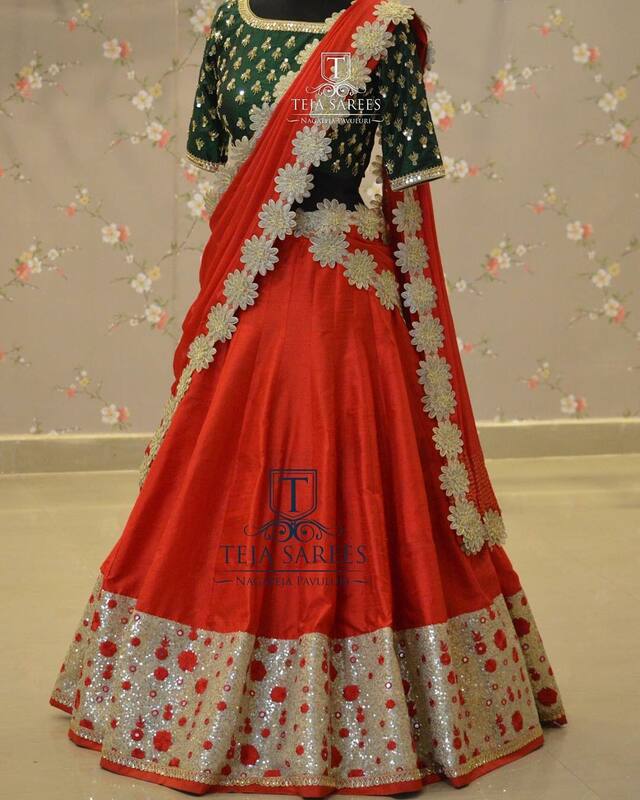 Bead work with chic sleeve and neck is a welcoming style to your modern half saree look. Add drama to your blouse by opting contrasting embroidery patterns and a stylish back open. Short sleeve blouse go well with flared skirts. Wear this arresting combination in interesting shades like the one below and you will be lauded for your choice of outfit. For a traditional half saree look, go for elbow length sleeves with bold zari work, and add a dash of sparkle with glittery stones. 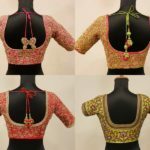 Deep back neck blouse adorned with chic tie back will part a fresh youthful appeal to your half sarees. 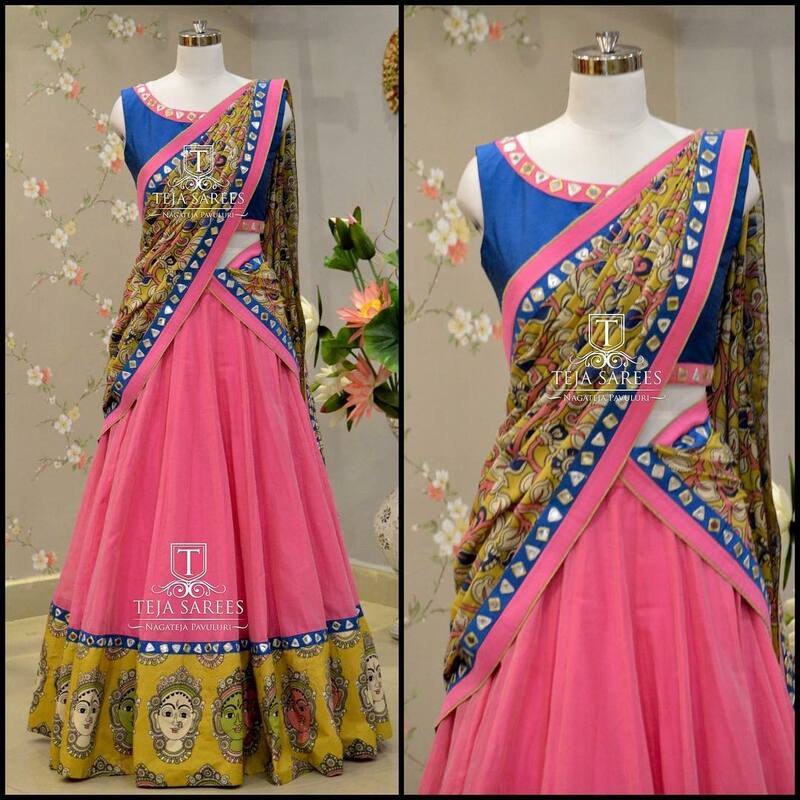 Bold zari borders is still a best choice if you plan to wear silk skirts. If the blouse is of darker hue, then opt for adornments around neck and sleeve border to highlight your whole look. Here is a full work blouse with lavish pearl detailing, done on the most delightful color combination. 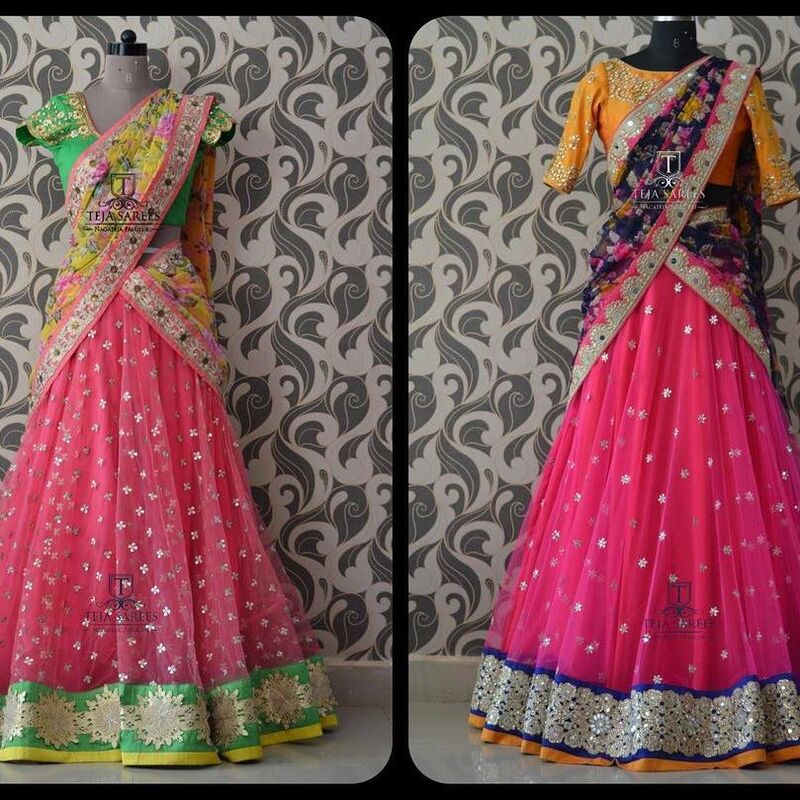 Brides, make a note of this dress for your sangeet and mehendi functions. Close neck blouse with fine ornamentation like this will make your half saree notable even if you stay a mile away from the crowd. 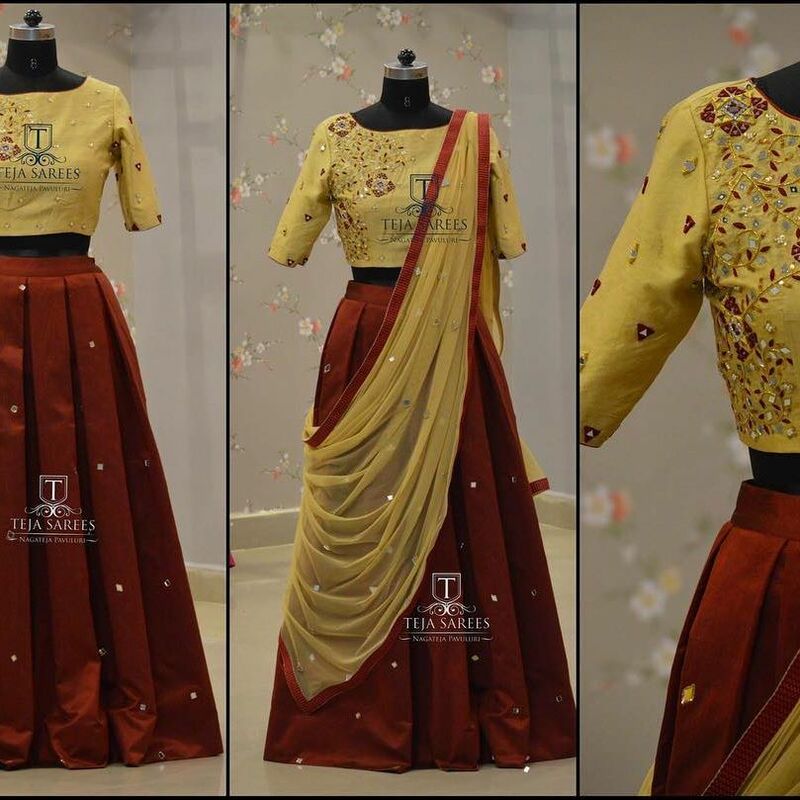 For those who shy away from heavy work, here is the most understated yet elegant half saree and blouse design to wear this season. 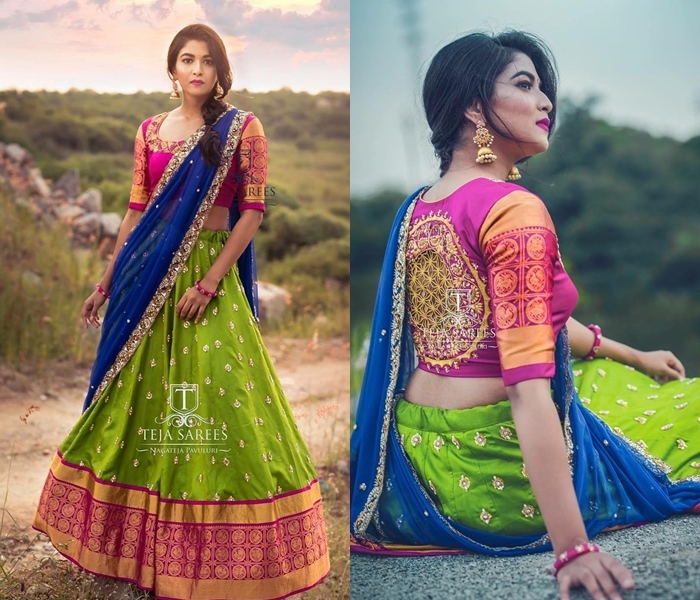 If the fantastic mix of colors here is not making you fall for this half saree style, we hope that incredible blouse will instantly make you covet it. 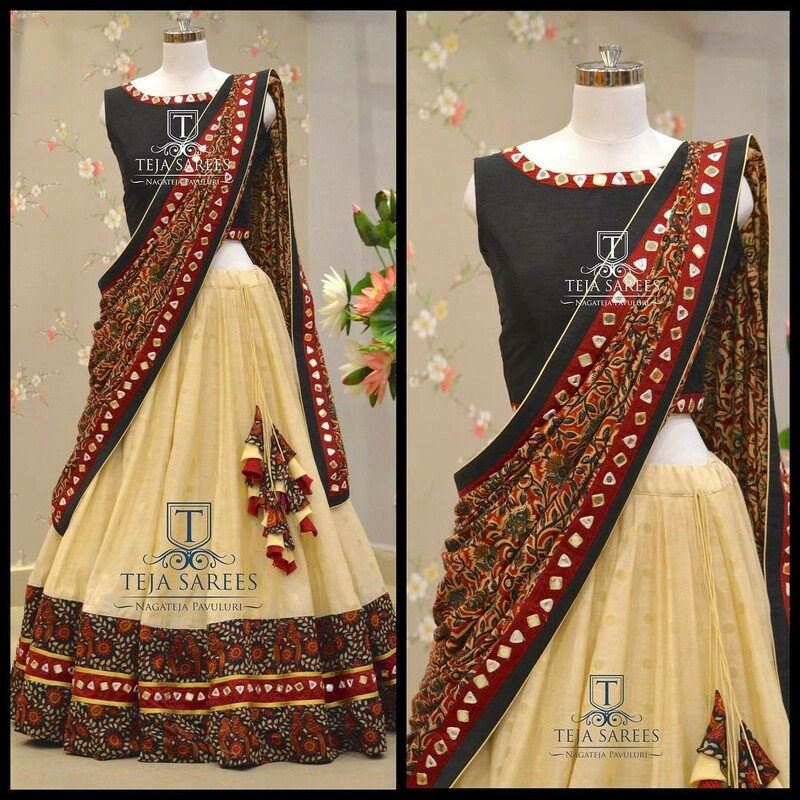 Kalamkari and mirror detailing is a brilliant combination for those who are so bored of other heavy work ensembles. 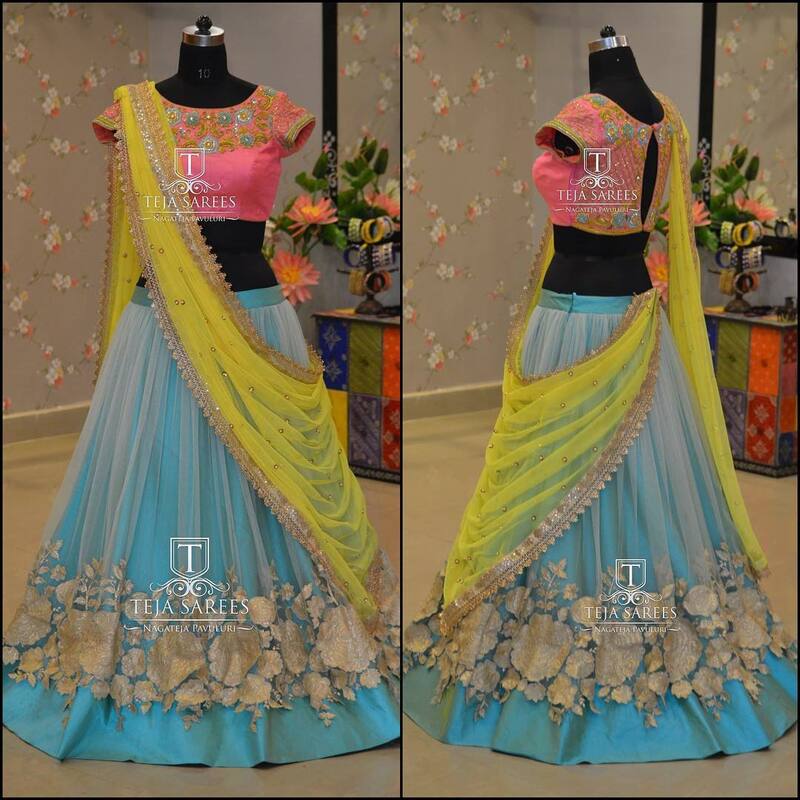 Keep your half saree look chic and arresting with these cute floral works on the blouse. 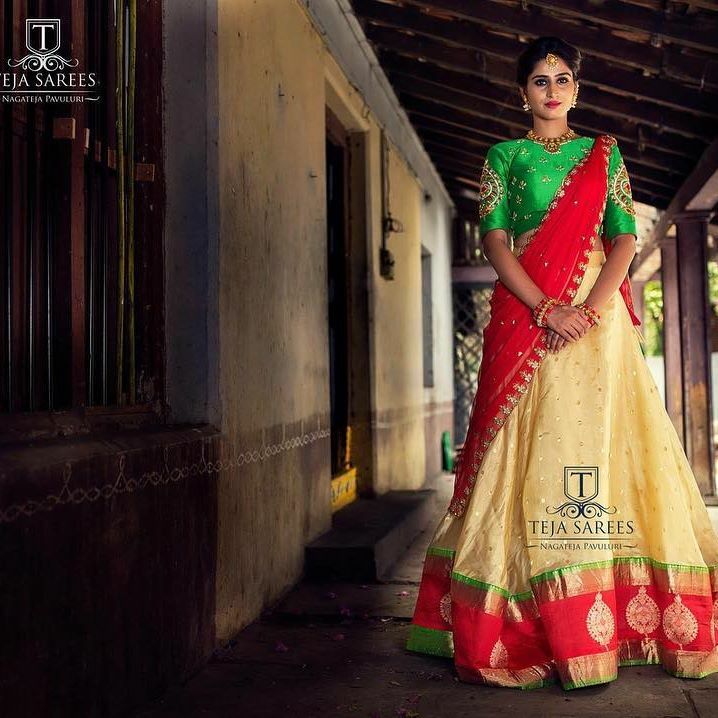 When wearing vibrant colors on your half sarees, opt for full zari work on the sleeve. 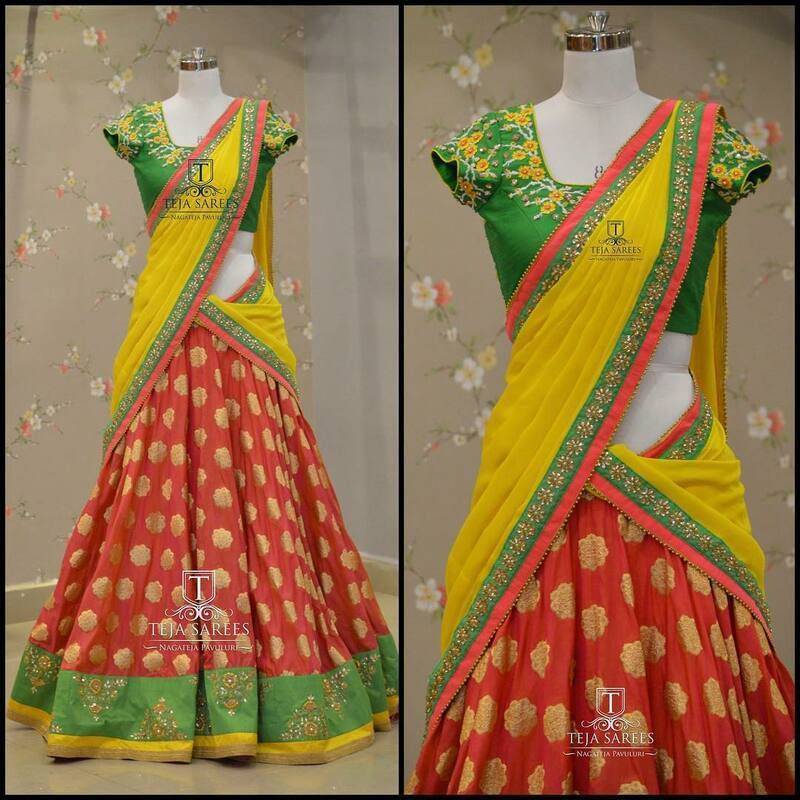 Customized patterns filled with catchy work, is another way to make your half saree catch everyone’s eye. 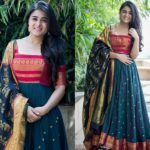 If you have net dupatta, then opt for attractive work in blouse yoke and sleeve, so it looks beautiful in between sheer layers. Have fun with cut work blouses. When your skirt is filled with heavy work and you like to keep all the attention there then try plain blouses. For a stylish appeal, opt for long sleeves. Cold shoulder blouses can instantly make your traditional half sarees look quite modern. Embellishments only on selected places will make your blouse more striking and appealing. A blouse like this is will make every one ask you about your boutique. 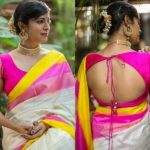 Glam up your half saree look with attractive back opens. Here is a heavy work blouse inspiration that every braid and bridesmaid should make a note dutifully. Make your blouse sensational with a beautiful floral work like the one below. 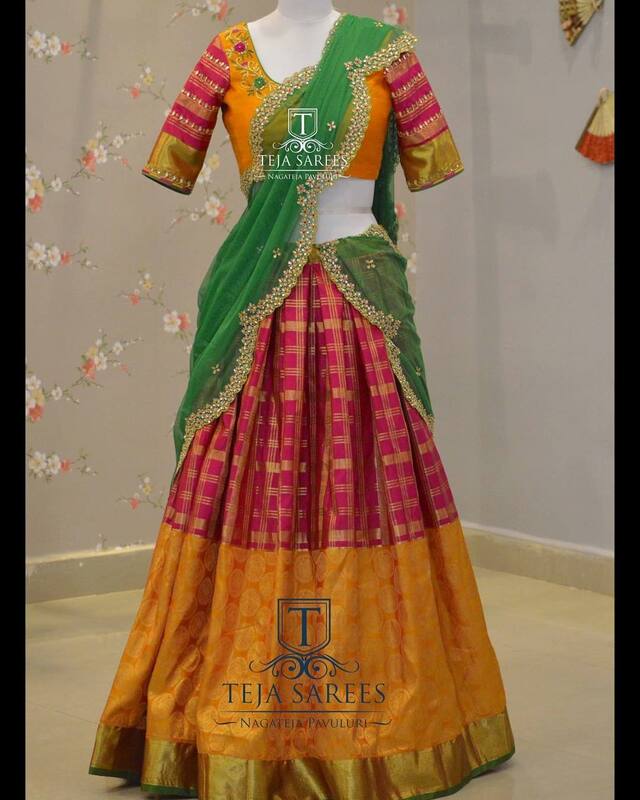 Did you enjoy the classic half saree and blouse collections from Teja Sarees. In case if you like to shop from them, please find the contact details below. Don’t miss the huge comeback of half sarees. Stay up to date and wear the modern iteration of this dress with all the elegance you can muster. 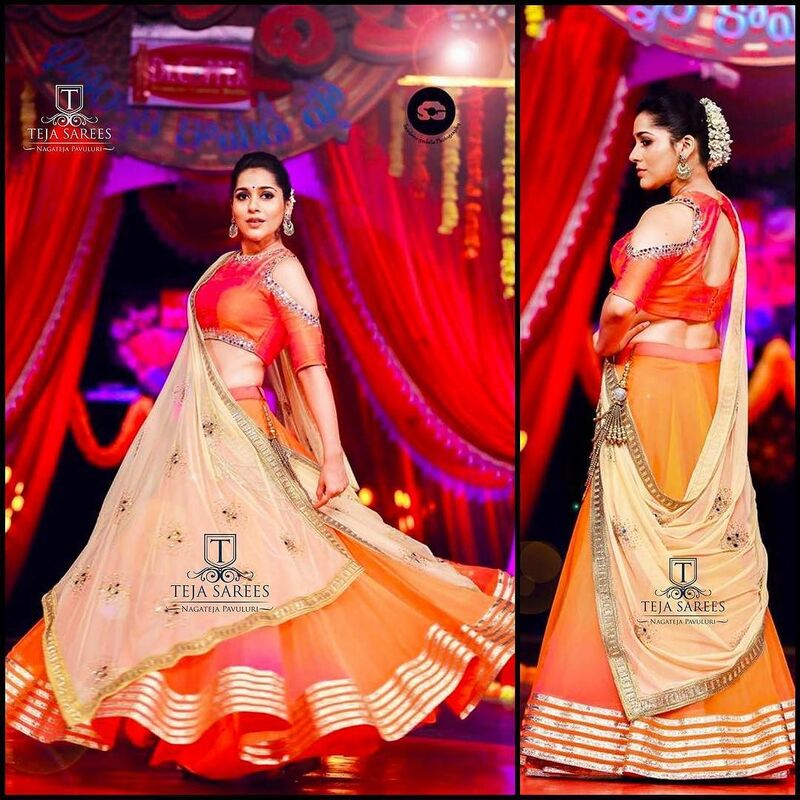 How To Make Your Half Saree Style Look Modern & Fun? Take Iconic Silk Saree Blouse Inspirations From This Label! Can some one help me how to order from this website. 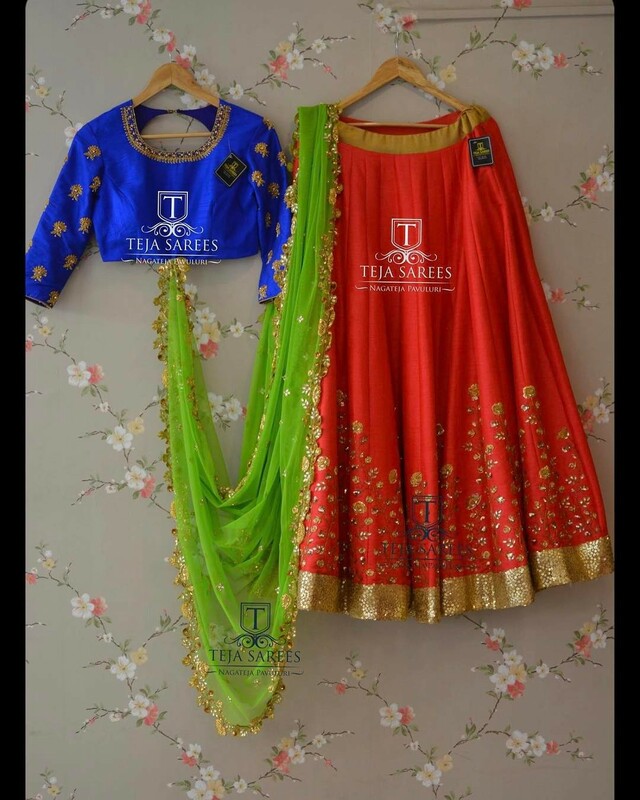 Hi, Please check the seller http://www.tejasarees.com/. Drop a message to them, they will help you out. Hi Rajeshree, We don’t sell this.